For many years, I have been entrusted with educating university students in class and through practical training. Everyone who has been involved in education knows that teachers must be nationally certified to teach, that is, they must have a teacher's license, to become a teacher in kindergarten, elementary, and junior or senior high school. However, a teacher's license is not required to teach at universities. It might seem strange not to require a teacher's license to teach at university since classes involve a higher level of content. I have not taken a single course that was required for a teacher's license, and of course, I don't have a teacher's license. This does not mean, however, that anyone can teach in university. Universities have their own screening process to decide whether a candidate has the ability to teach or not. Since university teaching is not a national certification, people who have been active in a certain field (sports, politics, etc.) are often invited to become instructors at universities. An acquaintance of mine teaches international relations at a university after having retired as a diplomat, while there are also many Olympic athletes who now teach physical education-related classes at universities. I bring this difference up in order to clearly underscore the distinction between the qualifications that are required for elementary, junior high and senior high school teachers, which are strictly controlled by the government, and the qualifications for university faculty that are not subject to government control, but decided by the university. This shows how much freedom the university faculty has in giving classes. This is the very significance given to Children's University, which is the theme of this post. Children's University Kawagoe was founded as a non-profit organization in Kawagoe City, Saitama Prefecture in 2008. Children from grades 4 to 6 of elementary school attend classes and practical sessions given by university professors and specialists active in a variety of fields. Nowadays, children's universities have been established in various regions in Japan. Dr. Noboru Kobayashi, Honorary Director of CRN, was appointed President of the Children's University Yokohama which began in 2014, and I was also invited to serve as Vice President. Today, we are living in an age of information technology, and elementary school students also have the opportunity to become exposed to knowledge outside the elementary school curriculum through TV, the internet or lectures for the general public. Nonetheless, it seems that interactive opportunities are rare where specialists give talks to elementary school students and the children can ask questions in return. 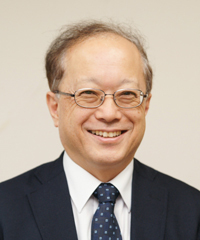 At Children's University Yokohama, we have also asked Professor Takeshi Yoro, President of Children's University Kamakura, which was established earlier, to give special lectures. Although the number of lectures given annually is not many, each one of the six lectures is attended by both parents and their children with enthusiasm. This year, the first session consisted of two lectures. Professor Yoro gave a lecture on insects, and I talked about "Why I Became a Doctor." Professor Yoro started his lecture with the question "What should I talk about today?" He hadn't decided what to talk about in advance, but chose the topic on the spot. In a free and easy manner, he started with how to make a collection of insect specimens and why he became interested in a common insect like the ground beetle. He noted that there are some five million species of insects in the world, but four million are new species that have not yet been identified. Talking very freely, he moved from one subject to another, and even disclosed to us some personal information that he is fond of six-legged insects, but totally detests insects with many legs, such as spiders and centipedes. Elementary school students and their parents alike all listened enthusiastically to Professor Yoro's talk. I gave my lecture in a quiz format, pointing to different places in town, asking "Are there any doctors here?" Many students correctly answered that there were doctors in hospitals, the National Diet, detention houses, and on passenger ships. I then explained that doctors work in many locations; for example, they accompany teams to the Olympic Games and mountain climbers on foreign expeditions. The purpose of the lecture was to break down the image of stereotype doctors being associated with hospitals and to emphasize that doctors can work in many different places. Starting with doctors who are part of a mountain-climbing expedition, I approached this topic in light of my own experience with a group that climbed the Karakorum and in international medical care in Nepal and Ghana. Quite honestly, I had an underlying motive, hoping that some elementary school student might decide to become a doctor (preferably, a pediatrician) someday. When giving a lecture to university students or adults, one can expect to receive a few questions, if any, afterwards, but in the case of Children's University, after asking if there are any questions, nearly all the students enthusiastically raise their hands. It is truly puzzling that this lively, honest curiosity fades when students enter university or become working adults. One might want to attribute it to discretion upon reaching adulthood, but students from outside Japan frequently raise their hands and ask questions, although not as much as elementary school students, so it might be owing to some kind of "Japanese discretion." After the session, some students went up to Professor Yoro to ask for his autograph, and soon, almost all the students were lined up in front of Professor Yoro and me to receive our autographs. A fourth-grade girl who asked for my autograph, confessed to me with radiant eyes, "I want to be a pediatrician." Needless to say, I was euphoric at heart.